Rubber bridge is the traditional and well-loved version of the game, and with our Pocket Size Rubber Bridge Scoring Table, you can be sure of scoring your games of Rubber correctly. We have compiled all of the scoring information you need on this handy table, and laminated it for longevity. 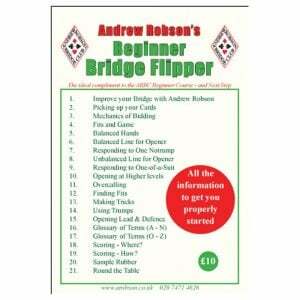 Scoring information includes Trick Scores, Premium Scores and Penalties suitable for Duplicate Bridge, plus Honours and Rubbers specifically for Rubber bridge.